Hi, I am interested in your 1971 Toyota Land Cruiser (stock #CTP2399) listed on Autotrader for $21,900. I'd like to get more information about this vehicle and confirm its availability. 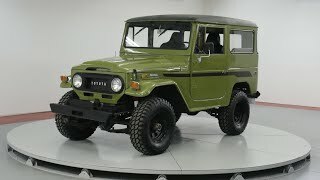 Worldwide Vintage Autos is pleased to present this 1971 Toyota FJ40. The Toyota Land Cruiser (J40), is a series of Land Cruisers made by Toyota from 1960 until 1984. Traditional body on frame SUVs, most 40 series Land Cruisers were built as 2-door models with slightly larger dimensions than the similar Jeep CJ. The model was available in short (J40/41/42), medium (J43/44/46) and long (J45/47) wheelbase versions, with petrol and diesel engines. -Painted PPG 45581 Mercedes Green per previous owner. -Chevy 350 V8 conversion. Approximately 11K miles per previous owner.